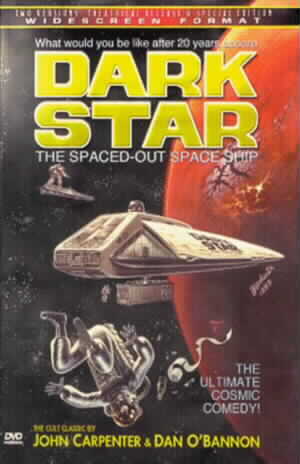 I first saw Dark Star at home in England on the TV. Nobody knows what makes a movie into a cult classic. Of course, being a quirky, low budget SF picture seems to be a big help but it is not always enough. Whatever it takes, there is no doubt that Dark Star has it in Spades. Put four of the most dysfunctional astronauts imaginable into a spaceship and send them off on a lifelong mission to find unstable planets and blast them out of existance. If that sounds like a thin plot then you should check out the special effects which make the plot look sumptuous. Of course, those cheap effects are one of this movie's charms. Where else can you see an alien made out of an inflatable beach ball and a pair of clawed feet from a joke shop? The real star of this movie is director, John Carpenter. Oh, OK, that beach ball alien merits a mention too! Carpenter also co-wrote the script and composed the music too but it is his directing that really makes this movie stand out. The one-step-back mood of the characters who all manage to appear to be on the ship but not part of the mission is the best example of this. Lt.Doolittle (Brian Narelle), in charge after the death of the mission commander, just wants to be back on his surfboard but it's never a big thing, more just something for the other guys to ignore. Dan O'Bannon as Pinback, a lowly technician who is only on the mission by mistake, performs the funniest ever alien hunting sequence down the dark corridors of the ship. Meanwhile, Talby (Dre Pahich) and Boiler (Cal Kuniholm) alternate between spells of navel (or star) gazing inaction and frenzied panic. It all adds up to a very funny movie which seems to deal up an additional layer of wit and weird with every viewing. Perhaps that is what makes Dark Star a cult movie.